My goal for this blog so far has been to write one post for each of the trips that I took. 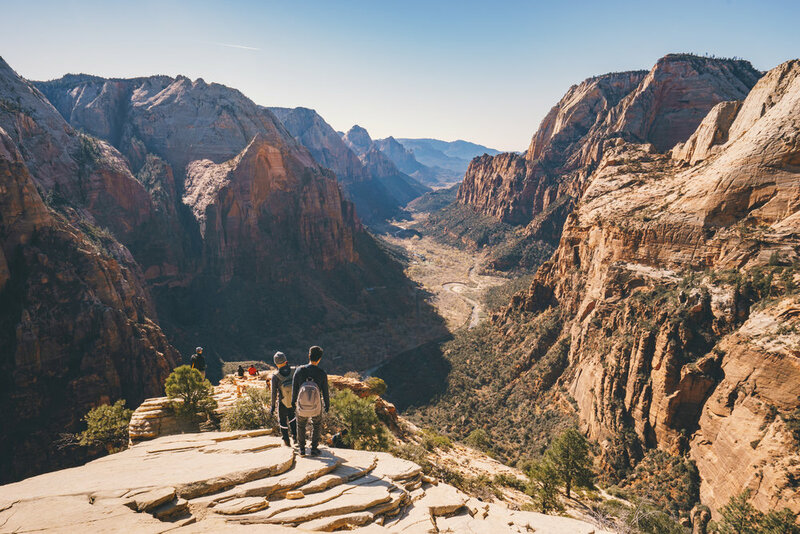 However, hiking up the Angels Landing is an experience that I feel would be interesting to those visiting Zion National Park so I've decided to dedicated a separate post for it. This will be Part 1 of a 2 part series on my trip to the beautiful state of Utah. The Angels Landing is one of the most popular trails at Zion National Park. This 2.6-mile hike up a 1,500-some foot tall rock formation is relatively strenuous and in some part quite dangerous with vertical drops from both sides of your path. According to the park ranger, the Angels Landing received its name from an early explorer (whose name I forgot....) who said that it is "so high that only angels could land on it". The hike can be broken down into three main sections: the Outer West Rim, the Inner West Rim, and the Angels Landing. At the end of the trail, you will be rewarded with a breathtakingly beautiful view from the top. We parked our car at the visitor center and took the Zion Canyon shuttle to The Grotto drop-off point located just across the Virgin River from the West Rim trailhead. We've read recommendations on the internet that the best time to hike this trail is early morning when it is not too crowded. Still, there were quite a few people in front of us already when we arrived at 8 am. The Outer West Rim Trail follows the side of the Virgin River with gradual sloping. Early morning light was perfect for photography and it was this part of the trail that I've got most of my good shots. The beginning part of the Outer West Rim follows along the Virgin River. See the big canyon on the left? That's the Angels Landing and we are heading to the top! From the top of the Outer West Rim looking back. Talk about perfect lighting! The trail started to get a little steeper as we parted from the river. The early winter temperature was around freezing point but we soon took of our outer layers off as we hiked upward. The view also got more and more beautiful. We would stop to take photographs at one spot only to do it again and again. Not far from the spot where the shot above was taken, we turned corner and headed into the second part of the trail, the Inner West Rim. Looking back towards the valley as we are about to turn into the Inner West Rim. Looking back through the canyons to where we came from. Making our way up the Walter's Wiggle. We turned away from the valley view and started moving in between the canyons. Temperature dropped as we continued our hike along the trail. We could see the layers of the rocks and interesting rock formations along both sides of the path. As we thought that we were close to the top, we made a U-turn behind the right canyon wall only to find a big surprise. Arguably the most famous part of the West Rim trail, Walter's Wiggle is a series of 21 steep, quick switchbacks that was "a trail construction wonder". I could hear the collective sighs from fellow hikers as we prepared to make our way upward. It is hard to capture this part from the trail but I've found a cool aerial shot of it. Finally we reached the Scout Lookout. This is a good spot to take a break. The view of the canyon here is quite impressive in itself so don't feel like you are missing out if you do not want go on. The path from now on is dangerous and it is here that only the brave ventures forward. Hikers rested at the Scout Lookout. There were already quite a few people heading up and down the Angels Landing. We were greeted at the beginning of the trail by a sign warning about the danger of the path ahead. Since 2004, 6 people have died falling off the edge of the cliff along this half-mile hike. I was determined not to be number 7 so I put away my camera before the climb. Photos from this point up to the top are taken with the iPhone 7. The path was steep and there were chains to hang on to. There were spots where we had to wait for people to come down before we can continue upward. See that narrow path in the middle? We had to walk through that. To the right of where I was standing is the Big Bend. The Big Bend - If you look carefully you would be able to see us Angels Landing Hikers from the bottom! Look how close we were to the edge of the canyon! The size of the Zion Canyon shuttle bus will give you a sense of how high up we were. We reached the top of the Angels Landing at around 10:30 am. It took us two and a half hours to hike from the bottom to the top. It was quite crowded already and the light was also quite harsh. If I had the chance to come again I would start even earlier. Nevertheless, the view from the top is breathtaking. 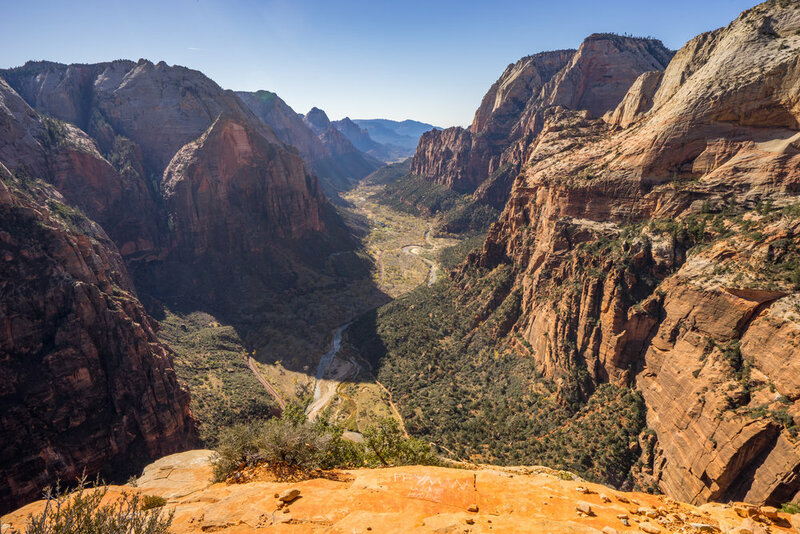 Click through the photo below to see all the shots from the top of the Angels Landing. I'd say that Zion National Park is definitely my second favorite National Park in the country (The first being Yosemite, Go California!). Special thanks to Pop Siritanasak (500px) and Pat Kitsanayothin (Instagram @ppkits) for some of the beautiful photos in this post.